I just have to grab a few things on my way back to New Tenacity. Artifacts, you know. Objects of intense mystical power. The usual. Lifeline 2 is a sequel in form, not in content, to the tremendously successful Lifeline from earlier this year. Lifeline was one of the first games to work on the Apple Watch, which may have helped get it the spotlight, but it did a number of other things well: a clean attractive text interface, a good use of delays and notifications, and a story about a convincingly endangered protagonist. It also demonstrated a game format that was plainly reusable. Lifeline makes the protagonist a separate character who is reaching out to the player for help — a strategy that deals immediately with gaps between player and protagonist knowledge, and explains occasions when the protagonist won’t do what the player wants. It allows for strongly characterized narrative with a definite voice. It’s not by any means the first game to do any of these things. There are classic parser IF games with strongly-characterized narrators (Lost Pig, Violet, anything by Robb Sherwin). There are assorted games that consist purely of back-and-forth conversation (Fail-Safe, The McFarlane Job, Hana Feels, Coming Out Simulator 2014, assorted others) or use some other method to pry apart the protagonist and the player-character into two separate entities. And there are other forms of interactive story that make use of notifications and real-time delays, from ARGs and email-enhanced game concepts to the delayed events in Fallen London. But Lifeline put these together in a particularly effective way and demonstrated how others might do likewise. In the “attempts to do likewise” category, we already have Timecrest, a fantasy game about a world threatened by time-frozen meteors: if the time-stopping spell holding the meteors back should ever fail, the result will be instant obliteration. That much is kind of a cool hook, but the writing is not spectacular and the introduction does a ham-handed job of drawing the player into the situation. Meanwhile, 3 Minute Games is exploring the format further as well, and doing so with another pay-up-front game with no fiddly f2p cruft inside. In Lifeline 2, you’re steering a teenaged witch named Arika through various problems, giving her advice through some magical medium. She is sarcastic but gloomy, having suffered through Buffy-esque hellscape events in her very recent past, and she seems to be reaching out to you a little as one might call a crisis hotline. The world she inhabits is a magic-infused variant on the Pacific Northwest. As with the original Lifeline, this is mostly a gauntlet structure with a lot of purely cosmetic divergence. The diagram here isn’t a diagram of the actual structure of Lifeline 2, which would be vastly larger, but a generalized representation of how it usually works: you’re offered a choice of exactly two options every few sentences, at about the same pace as in an inkle game. 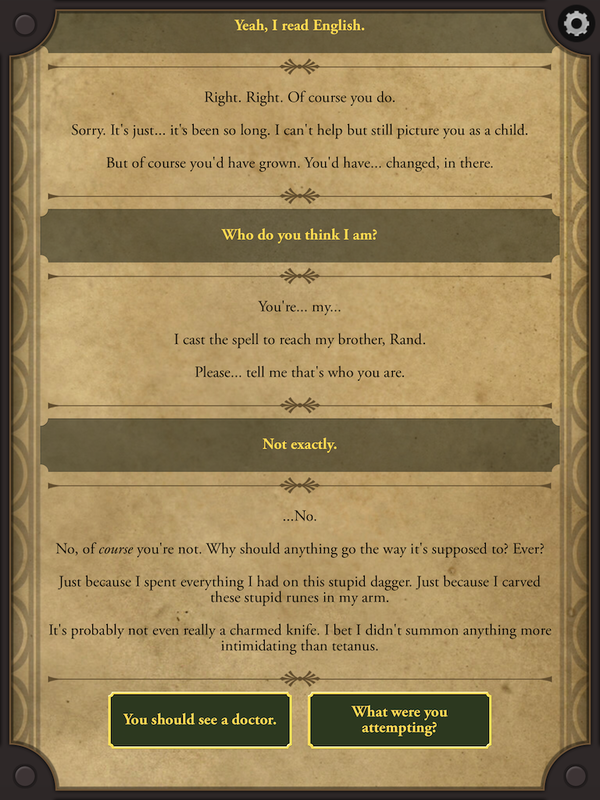 Most of those choices are without consequence except in the player’s head: your two options are essentially cosmetic variations on the same instruction; or they’re not instructions at all, but generalized chat encouraging your interlocutor; or the protagonist ignores your advice if you pick the thing they don’t want you to pick. In any case, a great deal of the time the paths rejoin immediately. Occasionally they don’t, and you get branch-and-bottleneck instead, with multiple turns of divergence before things come back together. Very occasionally, you wind up on a path that does something dramatic, like kill the protagonist. The very fact that this is a conversation makes that format more palatable than it would be otherwise. We expect different things out of conversation than out of pure directed narrative, and even cosmetic differences in what we say to the protagonist can feel important, like part of an evolving relationship. I did encounter a few pieces of delayed consequence — a few things you can do at the midpoint of the game that affect how it plays out later — but I’ll save that for spoiler space. So far, so good; but Lifeline 2 is, to my mind, both less fun and less believable (within its own genre) than the original. One of the clever tricks about the original Lifeline was that Taylor was in an unknown situation and genuinely had no one else to rely on. Though she knew more than you did about how you’d gotten there, the two of you were otherwise exploring together. And it made narrative sense that she had to focus first on really simple tasks like providing herself with heat and food sources. Being crash-landed on an alien planet focuses you at the very base of your Hierarchy of Needs. Arika, meanwhile, is tromping around Oregon. There are plenty of people she could interact with. If she’s hungry, it’s because she doesn’t have enough spare cash to stop at Denny’s, and there’s not a lot you can do about that from where you’re sitting. Most of the time she complains, and then snarks at you for whatever advice you try to offer. It feels not just unearned but outright bewildering when she comes out with remarks about how much you matter to her, within the first few hours of game time. You care about me? Why? You barely know who I am, and we spend most of our time with you being rude when I tell you you might want to cut back on the blood magic. This girl doesn’t seem real in other ways either. She does not talk like a teenager. Her cultural references should mostly come from ca 2005 onwards, plus the kind of nostalgia-culture that you might pick up as a kid. Instead, her dialogue is loaded with references to The Doors and David Bowie, Dune and Happy Days and fourth-doctor Doctor Who and The Rocky Horror Picture Show. While I might buy that a teenager is aware of a couple of those things due to a geeky special interest — I’d buy a The Doors reference from Lane Kim, say — this character seems implausibly at home in the 1970s. Further, she’s supposed to have been raised in a weird backwoods mage commune, and when that went wrong, she became a homeless runaway. Nonetheless, she looks down on diner food and makes quips about, say, how much of a drag it is to fly economy class. No. This character has likely never been on an airplane, let alone flown business class in order to develop views on the comparative comforts thereof. Meanwhile, Arika’s magic works through bloodshed, which means that she cuts her own arms in order to power her spells. At the beginning of the story it felt as though this might be setting up to say something about self-harm. Then it doesn’t, really. She just periodically cuts herself for spell purposes. No big deal! the game implies. And that’s a weighty topic to introduce if you’re not going to do something with it. Then there’s the contrivance. Arika is, of course, your sole source of information about how sorcery works in this universe. She’s constantly popping out with remarks like “now I must go find the key of the Timeless Monks!”, whereupon you have not much choice other than to ask her, for the fiftieth time this game, what on earth she’s talking about. The rules of magic in this world are very much established as you go along. That’s fair enough — it would have been deadly to sit through an opening lecture on the topic — I couldn’t help feeling that these rules were being made up to support the plot, rather than having an independent plausibility. Inevitably, you and Arika have to go find several McGuffins in order to open the hell dimension that contains her brother, etc. And inevitably, the McGuffins are in spooky abandoned locations with creepy individuals hanging about. The spooky locations are (in my view) mishandled. For instance, we’re told we’re going to the abbey of the Timeless Monks who keep a giant clock. And then it turns out that, shock! they have decorated their abbey with loads of clocks, and they are able to make time behave strangely. The abbey-filled-with-clocks is a cool picture, but the story leads into that in a way more or less designed to minimize the impact of the imagery. Because I’m getting all this janky world-building from Arika, I start to sort of blame her for it personally, in a way I might not do in a TV show with a stupid plot but an endearing protagonist. And finally, a goodly amount of the game winds up being focused on transportation questions even though in this universe transportation is much less interesting than it was in Lifeline. Arika isn’t exploring the Pacific Northwest; she just needs to get around it, from McGuffin Stop 1 to McGuffin Stop 2, but we have to have these transitions, apparently, to create occasions for invoking Lifeline-style realtime effects. More, you have multiple points where you have to decide whether to make her walk or let her use magic, and they use the exact same text each time, with the same quips and complaints. The combination effect of these things — Arika is snarky, Arika doesn’t really need you, and Arika is asking about boring, repetitive decisions in a universe whose rules are much better known to her than to you — is the sense of anti-agency, of actual futility, in some of the options you’re given. She asks whether she should use dark magic to get somewhere or hitchhike, but (at least the first time this comes up) I the player know much too little about the dangers of “dark magic” in this universe to give a sensible answer to that question. And when I do pick something, she snarks at me about what a bad answer it was. So why did you ask? Was it just so you could shoot down anything I suggested? Why are we even having this conversation? Parser IF can be frustrating and choice games can be limiting, but the Lifeline model opens up whole new possibilities in game-v-player passive aggression. In any case, at least for me, we quickly reached a point where we were only having this conversation because I wanted to review the game. I still think there’s a lot of potential in the Lifeline gameplay structure. And as both episodes of Lifeline were written by Dave Justus, I can’t really blame a change of authorship. But the original had a certain spark. In this case I felt like I was reading something by an author who was bored or exasperated or on a tight deadline or who kind of hated what he was doing a little bit. Oh my God! I can’t believe that actually worked! I mean, an idea from a Doctor Who episode? That seems ludicrous! I guess those boffins know a thing or two after all! There’s lampshading, and then there’s a Signal From Fred, and it feels like this one falls squarely in the latter category. I had to play through this sequence multiple times because I died the first time, and it’s not the kind of thing that gets any funnier on repetition. Furthermore, you can execute her suggested solution before she suggests it, but then it won’t work. There are a couple of different and equally valid approaches to modeling The Truth in an interactive narrative. You can organize things so that The Truth is always consistent, a given solution always works, and the world model is something that the player can explore and master. This is often a good strategy if you expect the player to replay the game, or if you want to emphasize the gameplay rather than the story aspect of the experience. Alternatively, you can rig the system so that it produces a specific narrative experience, using Magician’s Choice effects to create fake agency, or writing your model so that it is modeling plot and knowledge issues. For instance, Shade-style “the object you’re looking for is always in the third place you check” (consistent experience), rather than “it’s always in the desk drawer” (consistent reality). The trick about the passage I’ve just been talking about is that it’s combining these approaches badly. It assumes that the player will be trying different passage combinations (say, LEFT RIGHT LEFT the first time, and then RIGHT LEFT RIGHT, and then something else, and so on) until Arika intervenes to suggest the repeat, and that the player will then implement the repetition and it will go well. Probabilistically, that’s a reasonable guess about how most players will approach the sequence the first time. But if I’ve played before, I might well decide to skip ahead by hitting RIGHT-RIGHT-RIGHT over and over again, and if I do that, I find that the loop still does not resolve until Arika suggests that I could repeat myself. Then it works. There are several paths that lead straight to death: if you “integrate” with the monks or team up with the evil possessed hand, that’s a pretty immediate game-over for Arika. You can also get killed in combat with various things. But you can also lose more slowly. As far as I can tell, it’s possible to fail at getting each McGuffin, and this will affect what ending you get: you can fail to get the ribbon in the first quest (in which case you skip the second quest and go straight to the third); you can fail to get the mystical key in the second quest; or you can lose the gambling game and get locked out of the lantern in the third quest. If you lose the gambling game, the story self-heals: the lantern is given to you later, in a slightly contrived way that still lets things go forward. The key does not come back to you: if you don’t have the key, you get a less-good ending. And that puzzle is the hardest to get right, I think. In the clockwork abbey, there comes a point where Arika is surrounded by monks. Fighting them will not help. She needs to cast a spell — which won’t do a lot, but buys her a little time — and then make a run for it. Under some circumstances, the key then gets apparently destroyed, because Arika does something she doesn’t mention to you in advance and that you didn’t even know was possible — did I mention that the agency gets pretty minimal here? But the game continues, rather than having her die. However, without the key, she can’t completely win the endgame. The solution is that she needs to be properly fed before the spellcasting. There are a couple of chances to eat during the monastery sequence — an orchard containing gross mealy apples, which apparently doesn’t work very well because she gets disgusted by the worms, and a kitchen off the refectory area. If you go to the kitchen and search around, you can find baby food with a hint of machine oil in it. This is safe to eat despite the machine oil, and it will bring Arika’s blood sugar up to where it needs to be for subsequent spell-casting purposes. You’re only likely to find the baby food if you’ve gone poking around parts of the abbey that aren’t obviously important, but the game in other places actively discourages looking at things off the beaten path. You get the opportunity to look at the cogs and gears decorating the abbey, for instance, but a) they turn out to be boring and b) Arika is rude to you about having made her look at something irrelevant. The original Lifeline had learn-by-dying puzzles too, but this one is more so. Finally, the ending: Arika’s final showdown is with a glowing green parasite that possesses people after entering their bodies through their mouths, which is the same threat as in the original Lifeline. They tell us that “magic is a lie”. I think we’re perhaps supposed to guess, in a horror movie way, that these things are actually taking place in the same universe, that Taylor’s future-alien-enemy is actually already here in present-day Earth, and possibly that these beings are responsible for the sensations and experiences Arika understood as magic. Maybe. The game doesn’t really spell this out, and it doesn’t really make a lot of sense. This entry was posted in commercial IF, CYOA, interactive fiction, Reviews and tagged 3 minute games, lifeline 2 by Emily Short. Bookmark the permalink. Taking your point about the lack of current references, I’m often surprised about how many/which of my (born 1971) pop culture references are still au courant. Today in my (college, so older teenagers) class I said that a proof is good as long as “every step you take” is valid, even if they’re not all necessary, and then I asked if anyone in class felt the urge to complete that with “I’ll be watching you” and everyone said yes. I’d guess that a lot of Bowie falls in the same category. However, I had to retire my joke taking off of “roaches check in, they don’t check out” several years ago (replacing it with “what happens in Vegas stays in Vegas”), and nobody recognized the Volkswagen “Simplify” campaign which I honestly thought might still be running. Maybe one moral is that ad campaigns are truly ephemeral. The Bowie reference in question involved recognizing an image of Ziggy Stardust, though; I suspect that’s a little more unusual among today’s youth than knowing some of the lyrics to China Girl or being able to recite the Babe With the Power exchange. And I bet it’s especially unusual among kids who haven’t had regular access to television or the internet since they were 9 due to being homeless. “Every Breath You Take” is obviously forever. I had to look up “Babe with the Power”! It was about eight years ago that I saw Labyrinth, so it’s not as imprinted on my brain as if I’d seen it when I was sixteen. Anyway, yeah, point definitely taken. My students thought it would be creepy for me to apply the song, but I pointed out that I would in fact be watching every step the take… in the proofs, which I have to grade. No depression and helpless feelings like Taylors drama. Just take “cast your spell!” and win! And I didn´t even find those “feeding-puzzles” or the maze at the church. Did they update the game to be played by 8 yo? I just went directly into the tower and took 2 tries (first I suggest to take the dagger as a weapon, poooor. No just CAST!) And just ate at the final village, no apple, no baby food. Ah yeah and one time I suggest to take a ride with a stranger. -> greens. Taylor is male….He just mentioned to be a good boy. Taylor was deliberately left with no specified gender. It is up to the player to determine the gender. It makes it easier to connect with them. In Silent Night it is made pretty clear, right from the start, that Taylor actually is a man. Just finished this game and was disappointed compared to the first two revolving around Taylor. Erica isn’t an interesting protagonist, at least not to me. Only died once, and never went through the maze or the baby food stuff. I was able to get all three things and after that, the ending came pretty easily. I actually enjoyed the ending a bit more than I would have if it wasn’t for the connection to the previous two Lifeline games. That said, though, one thing to note – the order of the macguffin quests is randomized! Not even just with each story path, but if you rewind to the choice just before Arika announces the next quest, it changes each time you go forward. (After my first death in the orphanage, I went back and started exploring all the dialogue branches – I like to take the ones with the most interesting dialogue and character development – and although my first playthrough had us going for the lantern first, the second offered me the orphanage right away. Then I rewound to see the other option just before the quest announcement, and it offered me the key quest. Then I rewound that same option a few times until it offered me the lantern choice again. I want to go through in the same order as my first attempt.) So there is no set first, second, or third quest – it’s just the key, lantern, and ribbon quests, and the order in which you get them is up to the game (before you unlock rewinding) or you(if you decide to rewind to get the one you want, once you have the option). That said, though, one thing to note – the order of the macguffin quests is randomized! … interesting! It wasn’t obviously randomized when I played, so either I happened to luck into getting the same quests in the same order each time, or they’ve actually changed this up since the initial release. Entirely possible. I only just started playing it a day or two ago, and I have no idea how long the game’s actually been out for, so I can’t speak for whether it’s always been that way or if it’s a thing they added. But I can definitely confirm it’s a thing now. You were on point about the repeating dialogue for the transportation wearing on the nerves, though. If there was any repeating dialogue in Lifeline or Silent Night, I don’t recall it, so it’s weird to see the sequel using a cheap corner-cutting tactic that even the original game didn’t take. For all the reasons you listed, though, and a number of ones you didn’t, Lifeline 2 is definitely the weakest of the series. I’m not exactly disappointed, in that it wasn’t BAD, but I’m underwhelmed. I had to go look this up, simply because I was as convinced as the reviewer that Arika was a teenager and I was sure there was a reason for that. And indeed there was – it was because the game told us she’s a teenager. Explicitly. It’s also probably worth pointing out that the game has been updated since I wrote this review, including changes to content. I don’t know the details of what all has been altered or whether those might include changes to the description of the timeline, but I do have the impression from what I’ve been told by other players that there have been changes to event sequencing and to some of the puzzles I described here. During the monks sequence, as arika is speeding around, some mysterious figure grabs the key before the monks get to it and hands it to arika. There is no explanation or future reference to who these was and she never seems to question it. Anyone else curious and confused? I’ve not been able to find the the maze that is mentioned. Can anyone give me a how to on finding that part? I heard there was an ending where Arika studies with some monks but I’ve not been able to find that either. Has anyone thought about these mysterious figures in the Lifeline games? I sorta feel like it’s all connected in a greater way than the alien antagonists, and this mysterious figure will have a greater part in a future Lifeline game. I mean, *SPOILERS AHEAD* in Lifeline: Silent Night, if you get the best ending, while it seems that Taylor is done for and is witnessing his own death in the black hole, he is (assumingly) saved by a mysterious figure who taps on his shoulder and specifically says “Wanna get out of here?”. Then in Lifeline 2, this (assumingly) mysterious figure reaches through space/time, takes the key from the Monks before Arika can grab it, dissappears for a few seconds, then reappears and hands it to Arika after thanking her. Lifeline Whiteout has a reference to a mysterious figure (albiet never directly and I can only assume it’s about the figure and the Greens), and Lifeline Crisis Line has a TALKING BIRD in the 5th story of a 2 story house who’s owners are presumed dead, that can Warp and Weft as Arika does, just without Bloodletting. Also, the Green-Eyed Woman has a shape-shifting, super strong reconnaissance fly, and the ability to Warp/Weft and slow/stop time. Come on, please tell me someone else is hoping there is a Lifeline soon that explains all these story holes and Mysterious Figures? Can someone help me to get the lantern please? The game with odds or evens did not work for me…..several times. I actually just finished this. I got all 3 items, the best ending and didn’t die once. When I finished I had to google if you could actually die. In the original Lifeline I died a lot. I didn’t care for this one as much but happy I made all the right decisions.